The Baltimore Sun reports that U.S. District Judge Judge Leonie Brinkema allowed the Baltimore Museum of Art’s motion for summary judgment at today’s hearing in Alexandria, Virginia. That means that the BMA is the owner of the painting, not claimant Martha Fuqua, who argued that she bought the painting at a 2009 flea market in good faith. Barring an appeal (or perhaps even with one), the painting will soon return to Baltimore from where it was stolen in 1951. 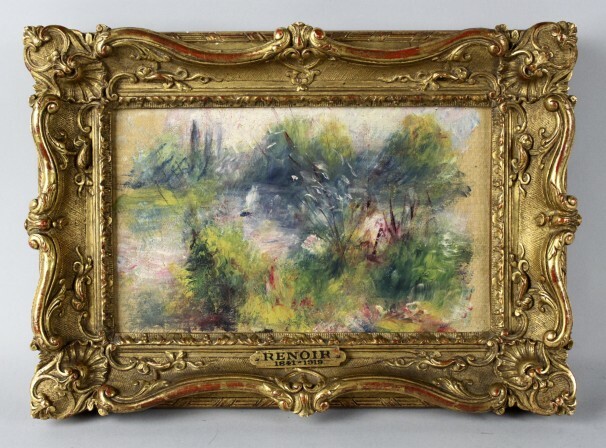 Hearing Tomorrow on Baltimore Museum of Art Claims to "Flea Market Renoir"
Judge Leonie Brinkema will hold a hearing tomorrow morning in Alexandria, Virginia on the Baltimore Museum of Art's motion for summary judgment to claim ownership to an 1879 Renoir painting Paysage Bords de Seine that the museum maintains was stolen in 1951. Claimant Martha Fuqua filed a motion to strike the BMA's reply to her opposition, arguing that the museum was introducing new evidence. The court swiftly denied the motion, and noted that the museum was responding to arguments she made for the first time in her opposition to the summary judgment motion (but gave her permission to file a sur-reply). The last remaining claimants for the 1879 painting by Pierre Auguste Renoir, Paysage bords de Seine that surfaced in the possession of a woman who claimed to have found it at a flea market, have filed summary judgment papers seeking final disposition of the case without need of a trial. The Baltimore Museum of Art has made its case that the painting was stolen from the museum in 1951, while Martha Fuqua alleges that she purchased it in good faith at a Virginia flea market in 2009 before attempting to sell it at the Potomack Company. The U.S. government seized the painting from the auction house and filed an interpleader action to determine the true owner; the other principle claimant (Fireman’s Fund Insurance) dropped out of the case last fall without explanation, apparently pursuant to an assignment. Heirs of the original donor to the BMA never responded or made claim to the painting. The case will now turn at summary judgment on the hearsay rule, a topic that have bedeviled generations of law students and lawyers.